A divorce is already a painful and emotional time. Don't go through the difficult process of dividing the assets or child custody alone. A divorce is full of uncertainty and stress for both parties. 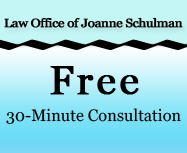 Get the legal support you need from the Law Office of Joanne Schulman, your family law attorney. With her experience and affordable rates, the moral support you need during your difficult time is only a phone call away. Additionally, Joanne makes it a point to return your phone calls after hours and on weekends and holidays.